The Alps didn’t fit our schedules and the Pyrenees — well, they are very far away. 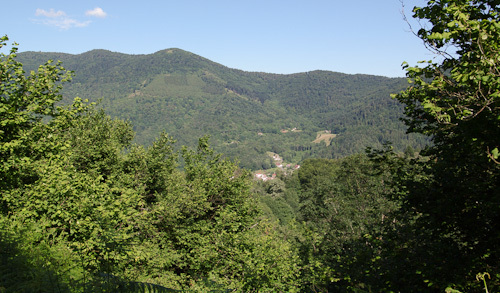 But there are also real mountains in one of our favorite regions, Alsace-Lorraine (and parts of Franche-Comté), and those stages fell on a convenient weekend. So we found a budget hotel and booked one night, planning to watch two stages. We were excited about the finish of Stage 7 on the top of La Planche des Belles Filles, which has an incline of 22% for the last 500 meters! 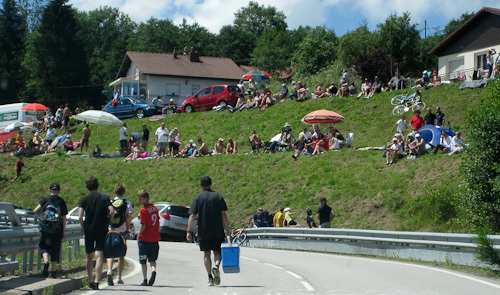 Anita’s only concern was whether she could keep from yelling at all the fans that always crowd around the leaders on the top of the big climbs. It was lovely weather when we arrived in Lorraine. 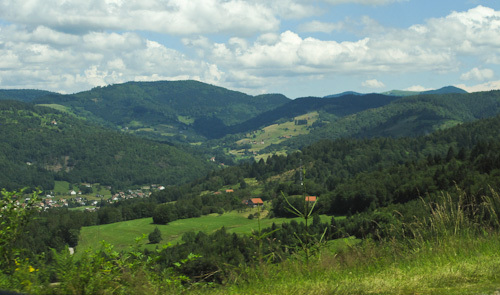 A typical Valley in the Vosges. Anita drove and I navigated using GPS and paper maps. I’d marked a few ways to get to the bottom of La Planche des Belles Filles. 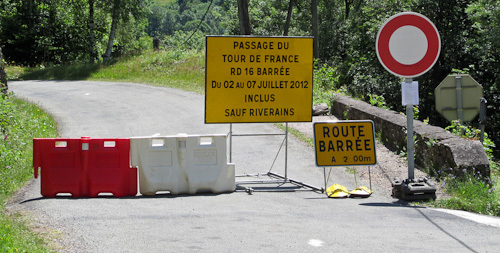 We were stunned to discover that every road was blocked at least 10 miles from the foot of the finish line. I was not happy. We had one alternative left, and it would only get us to the last little climb before La Planche. On my map, the road was labeled “RF” and squiggly. 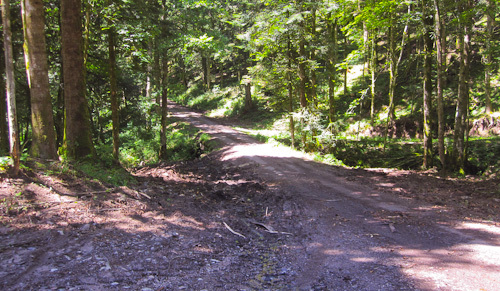 After seeing the thin line on our car’s GPS, Anita agreed to drive down the logging road (or “Route Forestière”). This is as close as we would get to the finish. 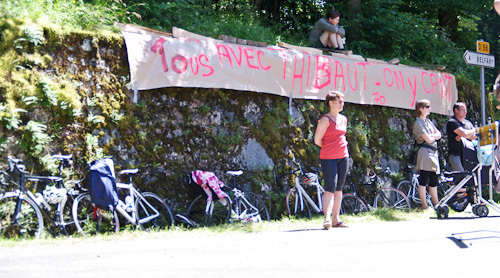 There were even police to keep us from walking to the final climb. I was a little frustrated. 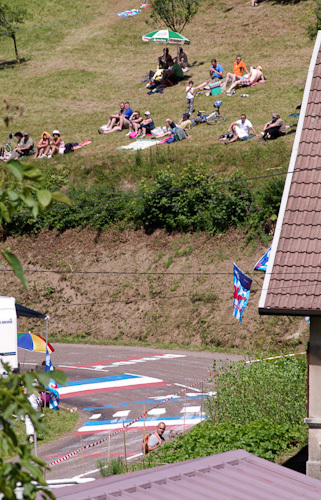 We fell short of our ambitions, but it was hard to be disappointed by the view at La Chevestraye. The Luxembourgish presence was no surprise. On this corner, they had come prepared! It was a lively spot, and people had clearly been camping there since morning. 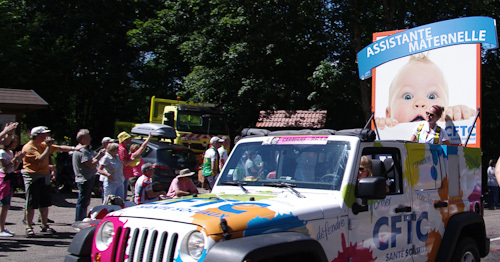 The festival atmosphere was exactly what we associated with the Tour. This message, “Everyone with Thibaut,” was all along the route. 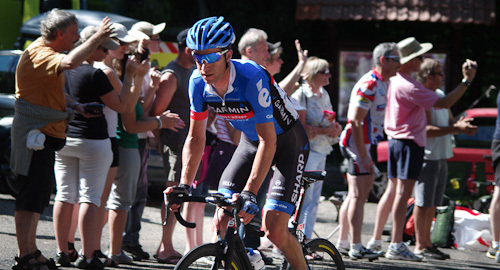 Thibaut Pinot was born nearby, and he was the youngest rider of the Tour. These young men from Belgium entertained everyone with antics and a megaphone. They were very funny and kept the show going for hours and hours. After a long time, the Caravan arrived! It was the end of the course, and they looked eager to finish. This woman was a notable exception. These guys were local promoters who were throwing out little cows on keychains. Adorable! The CFTC is a major French union. Its message looked less aggressively political than last year’s. A hand-off from the horse-racing (and gambling) industry. For the first time in our experience, Luxembourg was represented! They tossed out bike maps of the country. This may be an effective way to sell laundry detergent. A bit sexist, but eh … this is France. One should not conclude anything about the popularity of a product from its prominence in the Caravan. Anita chatted with two Americans who were in France on vacation and decided to see a stage or two of the Tour. 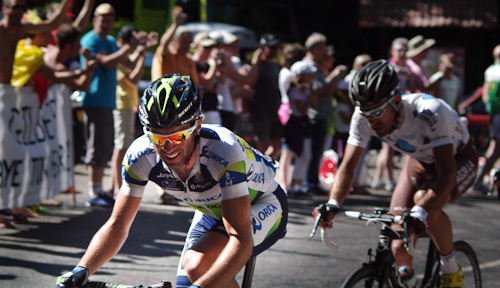 Michael Albasini, of Orica-GreenEDGE led with Christophe Riblon of AG2R — just barely staying ahead of the peloton. 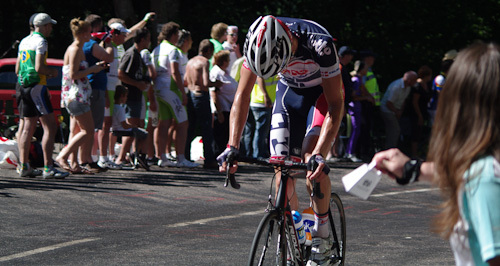 They were caught at the bottom of the final climb. Anita rang her cowbell to encourage a Lotto rider who fell off the back of the peloton. I believe this is the Illinoisan, Christian Vande Velde. He wouldn’t finish strong today, but he had a decent Tour overall. Here’s Mark Cavendish in the Rainbow jersey of the world champion. He was just looking to get to the top of the last mountain, at this point. 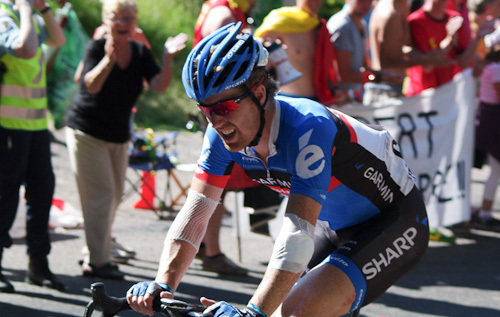 American Tyler Farrar, formerly of Leopard Trek, had a bad day. He was just ahead of the Broom Wagon when we saw him. 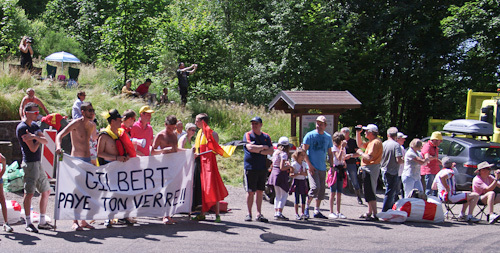 After the race passed, the police blocked the way to the finish. 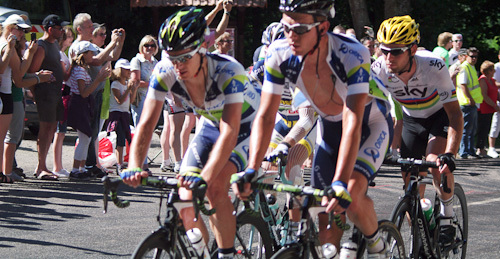 But several groups of cyclists did the course in reverse, including these men in their spiffy uniforms. 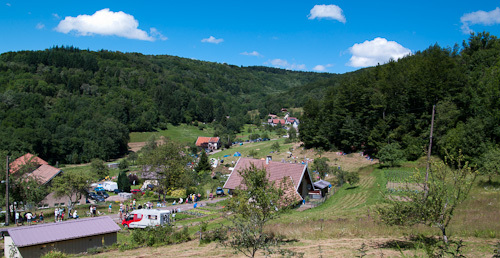 We stayed overnight just outside of Mulhouse, not more than an hour away. We were exhausted and spent what little energy we had strategizing for Stage 8. On the crest of Chevestraye, a memorial to those killed in August 1942 during a series of gun- and tank-battles to liberate the area. Chevestraye on cooler days. And on an old postcard. I’m so jealous you guys got to do that. It looks like it was definitely an awesome experience. I didn’t know La Planche des Belles Filles was so close. Perhaps we’ll have to go ride bikes up it some day. That is pretty disappointing you couldn’t get closer to the actual finish, but it looked like you had a good spot! Fact checking- Farrar did not ride for Leopard Trek. He’s been with Slipstream since 2008.